The movie tells about solitude. A 29 young woman, after 10 years spent working as showgirl in television biz, starts losing jobs, given to younger girls. 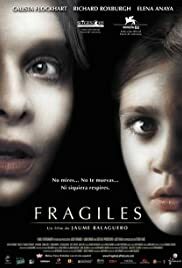 Fragile is a film about photography in the Post Soviet Era in St. Petersburg. It looks at the bitter elegance of this town, it's citizen and the tender and graceful models of Evgeny Mokhorev. A talented artist is haunted by the presence of a childhood imaginary friend, and her psychiatrist husband wants to have her committed to a mental institution. There is acting life (albeit horrific) after Ally McBeal! No kidding, I didn't know she could act. But Calista Flockhart can with fluid aplomb as demonstrated by this horror gem. Similar to "The Skeleton Key" in its plot and feel, this hospital horror boo-donit moves quickly into the murky depths of the strange goings-on at a children's hospital that is soon to be closed. When the new night nurse, Amy, played by Flockhart, arrives to take the place of the last (fleeing) night nurse, the creepy nature of the recent 'accidents' of the children and their subsequent fearful behavior give her pangs of heart-felt anguish at their suffering. Her protective instincts (heightened by a job related trauma she herself recently experienced) kick into high gear, and she begins stalking the underlying cause of these events, although the rest of the staff buttress the mystery with listless denial, or is their passivity a part of a larger, more sinister cover-up? The haunting music, sound and visual effects transparently blend together in a well spun intensity that doesn't require the more overtly obvious shock-factor 'bumps in the night' and miscues holding other less dramatically driven, cheap-thrills horror movies together. Hey, we all know its not real, but so is your money, and you won't be wasting it if you rent this movie!